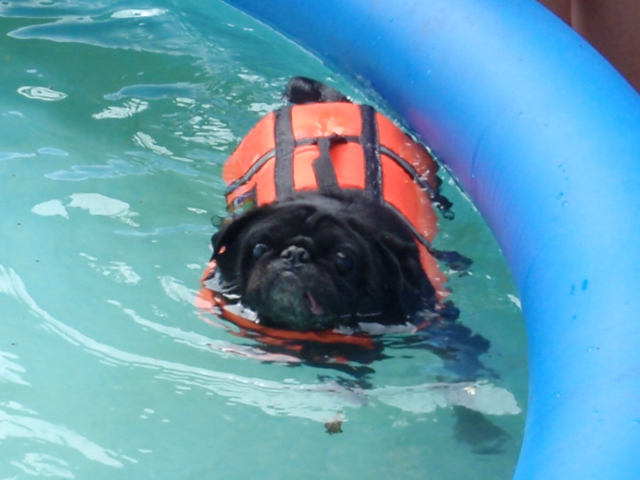 The votes have been tallied and the winners chosen for the 2016 Mid Atlantic Pug Rescue Calendar Contest. Thank you so much to everyone for participating. Please check out the winners at the link below. Click below to vote for your favorite photos to be featured on the 2016 MAPR Calendar! Mast cell tumors are a cancer of the mast cells. Mast cells normally reside in many tissues in the body, especially the skin, lungs, mouth, nose, conjunctiva of the eyes, and digestive tract. Mast cells are characterized by their intensely purple staining granules in the cells when examined under a microscope. Mast cells are part of the body’s immune system. They play an important role in allergies and defense again worm infestations. Pugs seem to be on of the dog breeds that are especially susceptible to mast cell cancer, especially in the skin. About 20% of skin cancers are mast cell tumors. 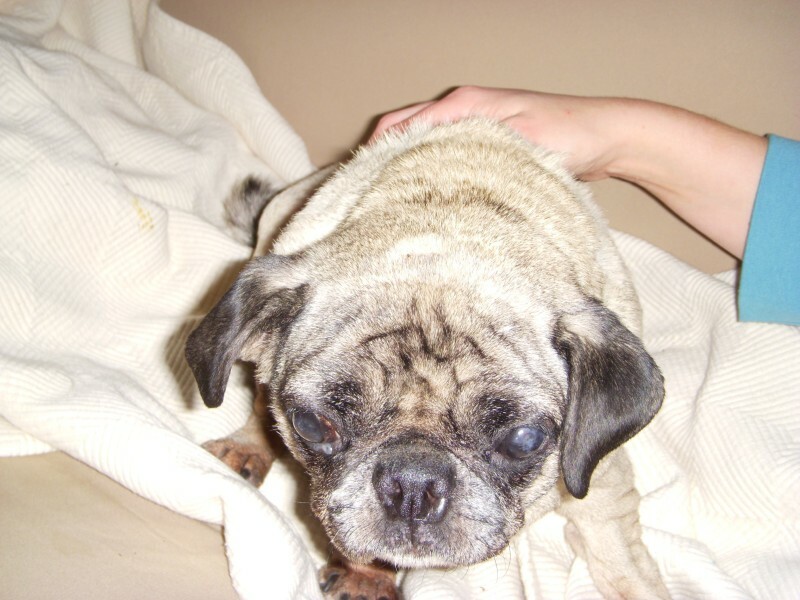 Once a pug has had one mast cell cancer, there is about a 15% chance that the pug will develop multiple mast cell tumors over his/her lifetime. 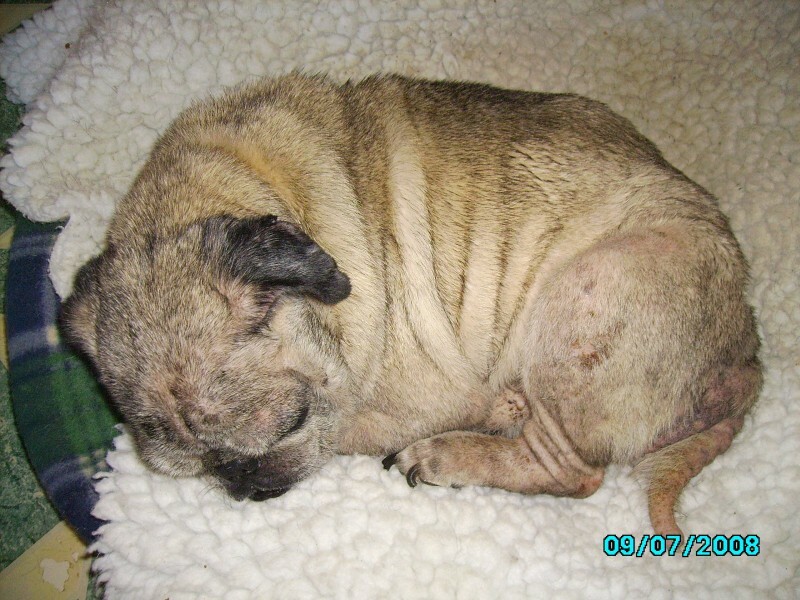 Generally the tumors occur in middle aged or older pugs, but mast cell cancer can occur in young pugs as well. When you find a lump or swelling on or in your pug’s skin, there is no one characteristic finding which will tell you if the lump is a mast cell cancer or a benign tumor . Sometimes the lumps are pigmented or bleeding. Sometimes they are rapidly change in size from day to day. The only way to make the diagnosis is by simple aspiration biopsy of the lump. Stage I – solitary tumor confined to the dermis (skin) without lymph node involvement. Stage II – solitary tumor with regional lymph node involvement. Prednisone therapy (dosed at 1mg per kg per day) is recommended before surgical excision of mast cell cancers. Apparently about 70% of dogs will respond with a reduction in the size and volume of the tumor. (J Am Vet Med Assoc. 2008 Jan 1;232(1):53-62.) This makes excision of the tumor easier. Surgical excision is the treatment of choice for Stage I tumors. There is not further treatment needed. New tumors may come up, and you have to keep an eye out for them by examining the skin of your pug regularly. All surgical excisions should have a wide margin (about 1.5 cm) of disease free skin taken at the time of the surgery. What is done for Stage 2, 3, and 4 is the matter of some debate. If the tumor is on an arm or a leg, then that limb might be amputated and/or radiation therapy given to the area. Radiation is use to try to “sterilize” the area of stray cancer cells. My pugs never seem to get tumors in areas that are easily treated. Suppressive treatment with prednisone has been recommended in the past but prednisone seems to have no benefit in improving long term survival. More about treatment will be discussed below. One of the important factors in determining treatment and survival with mast cell cancer is a determination of how nearly normal the mast cells from the tumor look when examined under a microscope. This is called the histiologic grade. Mast cell tumors are graded using a system developed by Patnaik as to the grade of the tumor (Vet Pathol. 1984 Sep;21(5):469-74. Expert Rev Mol Diagn. 2009 Jul;9(5):481-92.). Grade I – well differentiated and mature cells with a low potential for metastasis. Grade I tumors are benign. Grade II tumors, which seem to be the most common in my experience, can behave either benignly or can be more aggressive. There is considerable variation in their biological activity. That is some tumors rarely spread or recur while other Grade II tumors tend to spread and recur. Grade III tumors are very malignant. Unfortunately there is not always a lot of agreement among pathologists as to the grade of a tumor. Because of the variable behavior of mast cells graded as II, a number of other tests have been developed to try to sort out which tumors will be more aggressively. For example, one test is a silver (argyrophilic stain of nucleolar organizer regions or AgNOR score) stain of the mast cells. The black dots in the nucleolar region of the cell are counted. This information can be helpful in predicting survival. The higher the AgNOR score generally the poorer the prognosis because there is a greater likelihood that the mast cell cancer has or will spread. Another marker studied by immunohistochemistry is the marker Ki-67. Again, the higher the Ki-67 count, the poorer the chances are for survival. (Vet Pathol. 2007; May 44(3): 298-308.) Other markers are being studied and used, such as c-KIT since it has been observed that mast cell tumors with c-KIT mutations are associated with recurrent disease and death. Before determining further treatment for the mast cell cancer, the veterinarian will have to do a careful physical examination palpating for enlarged lymph nodes. Splenic and other biopsies may need to be done to see if the cancer has spread to the spleen or bone marrow. Lymph nodes may need to be biopsied. All these are done with needle aspirations and not open surgery, but they do require anesthesia. Sometimes the search for splenic or liver involvement can be done with ultrasound which is then followed by biopsy. (J Vet Intern Med. 2009 Sep-Oct;23(5):1051- 7.Epub2009Jul28.) Pugswhohavemastcelltumorintheirliverandspleenliveforamuch shorter period of time than dogs who do not have tumor in their liver and spleen. Buffy coat smears used to be recommended to look for the presence of mast cell in the peripheral blood. This test is a waste of money. Most dogs with mast cells in their blood have worms or parasites and not mast cell disease. All these therapies have some toxicity and adverse events. All seem to improve survival when compared with dogs who received no adjuvant therapy. There is not enough current information to tell if any of these regimens is superior. In additional to “traditional” chemotherapy, more targeted therapy for mast cell cancer has been developed. These new drugs bind to receptors on the cancer cell and on the blood vessels which feed the tumor. So both the cancer and the blood supply that feeds to cancer is killed. One, toceranib or Palladia, received FDA approval in June 2009 for use in treatment of mast cell cancer in dogs. This is a receptor tyrosine kinase inhibitor and should theoretically be superior to other chemotherapy agents. In the one published trial, about 40 % of dogs responded to tocernib. ( Clin Cancer Res. 2009 Jun 1;15(11):3856-65. Epub 2009 May 26.) Of those that responded, one-third had a complete response and two-thirds had a partial response. The drug is administered on an every other day or a Monday, Wednesday, Friday schedule. The side effects include loss of appetite, vomiting, diarrhea and bleeding from the digestive tract. 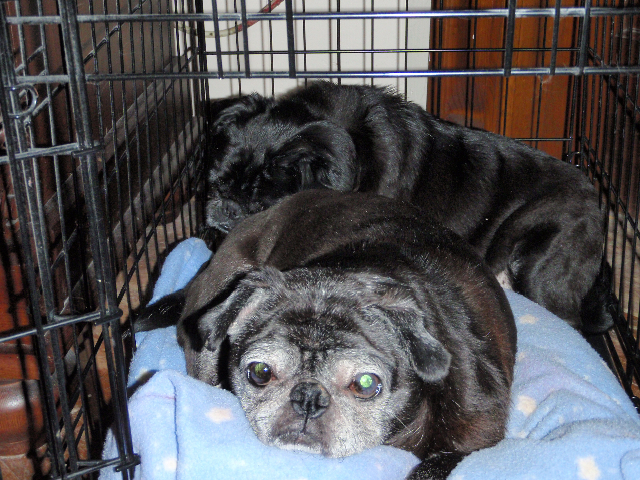 I give my pugs who are diagnosed with mast cell disease diphenhydramine 25 mg and famotidine 5 mg every day twice a day to counter the histamine released from the mast cells. And I continue this for life though there is no published research evidence that this is effective. Before any biopsy of masses that may contain mast cells, I would recommend talking with you veterinarian about pre-medicating your pug with diphenhydramine (Benadryl) 25 mg and famotidine (Pepcid) 5 mg (or cimetidine, Tagamet) because histamine can be released just from the biopsy procedure. I usually give the medication at home about 30 minutes before the procedure is done. consultation with your veterinarian or veterinary oncologist. Pug Dog Encephalitis: A unique disease to pugs this disease is fatal. 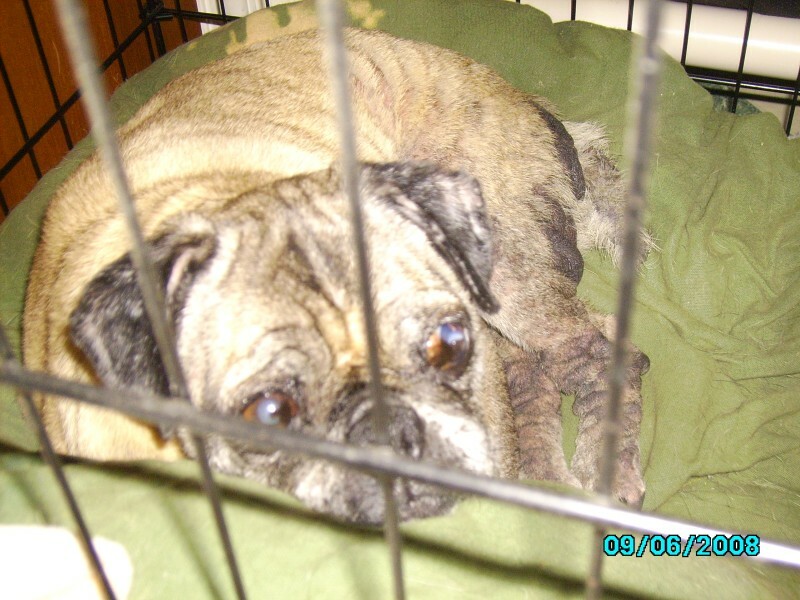 Research is still ongoing, but there isn’t a test at this time for the disease in live pugs. An inflammatory brain disease that usually shows itself quickly and takes the pug’s life in a few days, there is no treatment. Sufferers will have seizures, circling, blindness, coma and death. There seems to be a genetic component since it appears to run in lines. 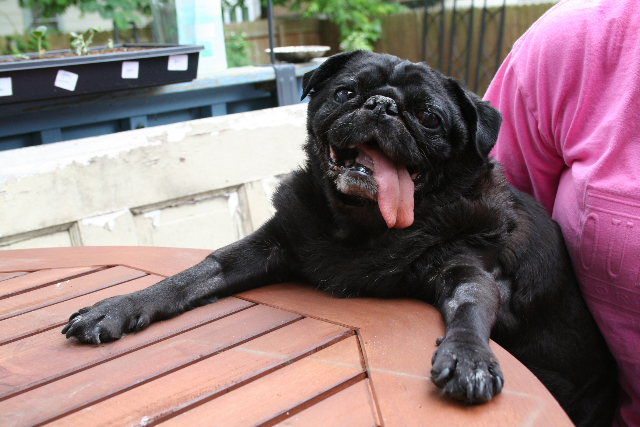 Epilepsy: If your pug has a seizure, it may not be Pug Dog Encephalitis. Some pugs have seizure disorders of unknown cause. There are medications to control the frequency and severity of seizure activity. Kneecap issues: Sometimes the kneecap will slip off to the side rather than sliding up and down as it should. This often causes limping, although it may sometimes appear normal. Surgery may be necessary to correct. Hip Dysplasia: Second only to bulldogs, pugs can have a deformity to the hip joint which may cause problems. 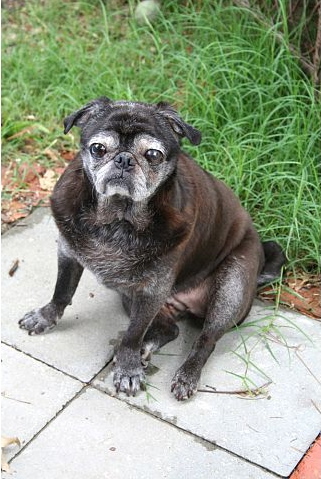 Stemming from heredity, poor nutrition, or simply environment, being a smaller breed pugs can often live normally with this condition (unlike larger breed dogs). This is more commonly seen in overweight pugs. Eye problems: Pugs’ beautiful big eyes do have tendencies to cause issues. They are susceptible to lacerations, prolapse (popping out of the socket from trauma), and eyelid/eyelash defects. Cataracts are also somewhat common. Dry eye (when the eyes don’t produce enough tear drops to keep the eyes moist) and Pigmentary Keratitis (dark black spots on the cornea or clear part of the eye, especially in the corner near the nose) often occur together. You should see the vet immediately if you suspect these problems and they often need life-long care. You should always keep your pug’s toenails clipped to keep them from scratching their eyes. Breathing issues: Due to their flat facial features, Pugs are prone to heatstroke and require air conditioning and special care when exercising during hot or stuffy conditions. If your pug seems to snore excessively or gasps for air, you should have your vet check things out. If your pug’s nostrils are pinched or if there are problems with the soft palette the vet will need to possibly perform surgery to correct. Ears: You should pay special attention, and contact your vet, if you notice any headshaking or if there is redness, heavy discharge, or odor to the pug’s ears. Ears should be cleaned regularly with an earwash. Soft palate problems: The soft palette is part of the pug’s nose and mouth. If it grows too long it can restrict air getting into the lungs. A sign may be excessive snoring or seeming to choke. Skin issues: Facial wrinkles must be kept clean and dry. Some pugs are prone to seasonal allergies, a vet checkup to have tests done to find the culprit might be necessary.